Brick has been one of the most popular choices for building for many centuries, even Henry VIII’s Hampton Court Palace is made of gorgeous red bricks, and it is likely that you house is made from brick too. Brick is durable and built to last, but there are some things that can cause damage to your brick work which, if not caught early, can lead to more serious problems such as water ingress or even complete wall collapse. 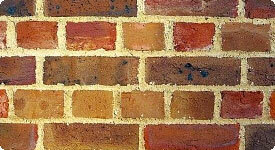 However there are a few simple things that you can do to care for and to maintain your brickwork. Once a year it is advisable to properly look over your brickwork and clean any areas that are showing obvious dirt. This can be a simple as hosing it down with the spray nozzle on your garden hose, or in some cases it may be necessary to mix one capful of bleach into a gallon of water before using a natural bristle brush to gently scrub off any areas of moss, mould or mildew (this can result from areas of brickwork that do not get much natural light and are close to overhanging vegetation). Ensure that you give the brick a good soaking before applying the bleach solution to avoid the brick absorbing the bleach. Water can damage your brick from two sources. Firstly from rain beating against your brick eventually soaking into the mortar causing the mortar and/or brick to split or crack. Or as a result of rising damp, when the salt crystals left behind after the damp naturally evaporates cause damage to both the mortar and the brick. Once the brick is water damaged, freezing and thawing cycles can quickly cause further damage to the brick, so catching water damage early is essential. If the mortar of your bricks has been damaged it will be necessary to repoint it. This will give your brick work a new lease of life and leave it looking much neater too. When repointing it is essential that all damaged mortar is carefully removed before adding thin layers of new mortar to form a safe and waterproof seal, mortar should be replaced to a depth of at least twice the width of the joint. It is also important to ensure that the new mortar matches to colour and texture of your existing mortar. To get a free assessment of your brickwork or to employ some of Bolton’s best builders to undertake any repointing or maintenance contact Wisecraft Ltd Bolton Builders today.